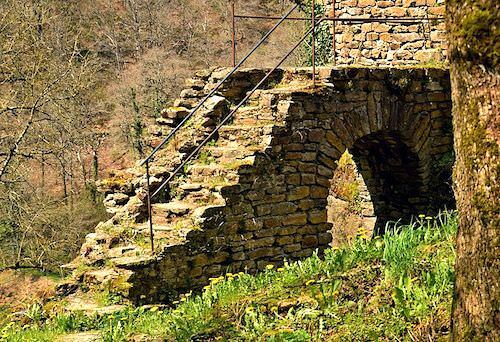 The Fort du Lourdou or Fort du Roc d'Anglars is perched on the impressive cliff Roc d’Anglars, some 50m above the river Aveyron. 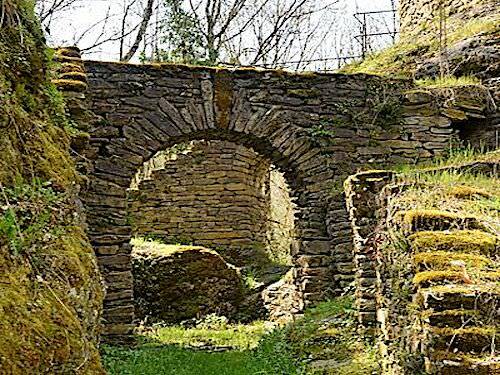 The fortified stronghold was erected in the 5th century and was Belcastel fortress’ first line of defense during the Visigoth invasions. 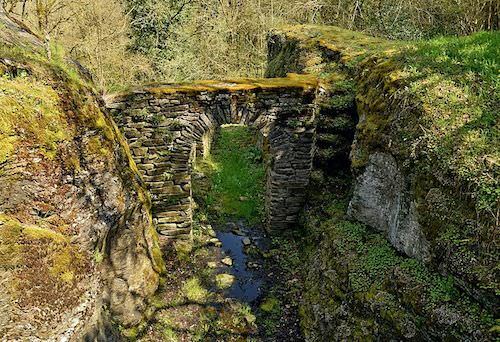 It was circular in shape with a diameter of 20m and spread over several levels protected by fortifications and ditches; it consisted of small buildings connected by twisted passageways that made it easy to defend when attacked. 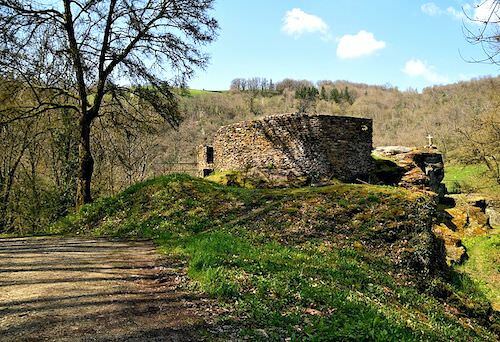 Belcastel, which is located 500m farther along the river, was not a Bel Castle (Beau Castle) - beautiful castle but a war castle - (bellum castle). It today overlooks its picturesque medieval village, which is ranked among the most beautiful French villages. 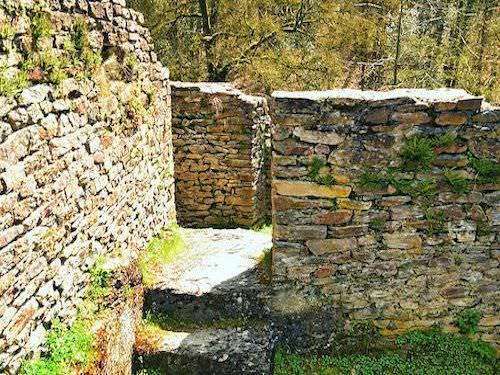 From there you can easily access the fort on foot; a well marked path that starts by the road, traverses a meadow and crosses a wooden footbridge. The fort took its name after the small grotto located nearby and dedicated to the Virgin Mary. 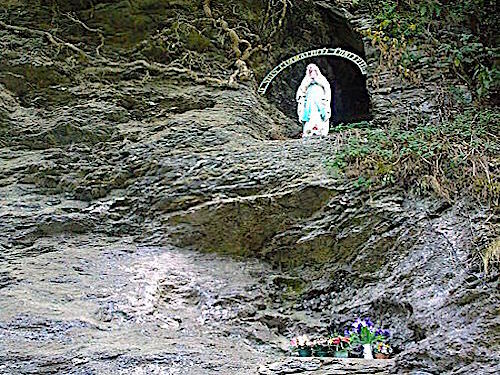 The Abbé Gély, the priest of Belcastel, thought that the natural cavity resembled the Grotte de Massabielle in Lourdes where the Virgin Mary appeared to the young Bernadette Soubirous in 1858. He named it Lourdou, which means Lourdes in the local Patois. The priest transformed the cavity into a small oratory with an altar, a statue of Our Lady of the Immaculate Conception and a place to light candles. He celebrated the first Mass in 1889. A wooden footbridge accesses the fort and the oratory; it also leads to the path that climbs to the top of the Roc d’Anglars and is bordered with wooden crosses that represent the Twelve Stations of the Cross. An interesting visit when in the region!